a few minutes ago, I uploaded the first public version of our collaborative drawing software. It’s a variant of a tool that has been used in experiments on “learning by drawing collaboratively”, see previous posts. 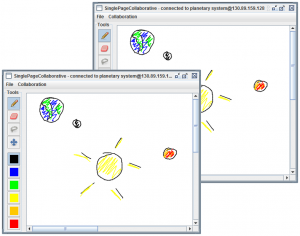 We tried to make the public version as simple as possible – you can run it via Java webstart here and create or join a synchronized drawing session by using the “Collaboration” menu. The sessions are managed by a server at our university, but no private or personal data is stored – only the drawing that you created. An unlimited number of users can work on a drawing at the same time. This entry was posted in collaborative drawing, collaborative learning. Bookmark the permalink.